You did it, writer! You set a goal—whether it was completing a book manuscript in thirty days, writing a poem, researching literary journals for your short story, or (woo-hoo!) getting an acceptance—and now you’re enjoying post-accomplishment euphoria. So it’s time to celebrate! 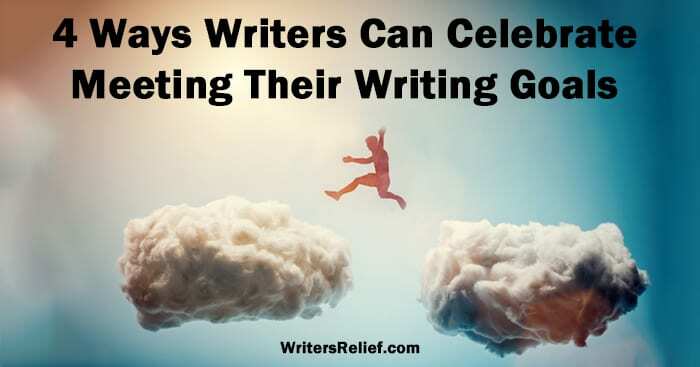 At Writer’s Relief, we love celebrating the achievements of writers, so we have a few suggestions for working off all that excitement before you get back to writing. As Neil Gaiman says: The one thing that you have that nobody else has is you. Your voice, your mind, your story, your vision. So write and draw and build and play and dance and live as only you can. You’ve completed the writing part, so it’s time to dance! Get your wiggle on! Display some fancy footwork—perhaps a twirl, hop, lunge, with a shake it all about flourish. If you need a song, we suggest “Best Day of My Life” by American Authors. When writing, most people lock themselves away from the world and its distractions. Now that the writing is done, however, it’s time to get reacquainted with the social life you’ve been neglecting. Those people hovering outside your writing space? They might look familiar: They’re your spouse, children, and good friends. Time to hit the town! See a movie, grab a drink and dinner at your favorite restaurant, or maybe just tweak…that last chapter…for a quick minute…oh no! Get outside before you spend another night writing at your desk! If you’ve accomplished your writing goal—especially if it’s a goal like completing the NaNoWriMo challenge—your back is probably sore from spending hours hunched over your computer. It’s time to limber up before you get back to the grind. Book a day at the spa, or schedule a manicure or pedicure! Or there’s always that perennial author favorite: lots of ice cream. Head out to your nearest ice cream shop or grab a pint of your favorite flavor at the grocery store. But don’t eat it too fast, because it’s hard to write with brain freeze. Since you’re already jumping up and down and running in circles, you might as well throw in some exercise! Use that positive energy and go for a jog, ride your bicycle, play a round of golf, or take a cardio class at the local gym. A little goat yoga can work wonders for the psyche. Author’s Note: I wanted to include couch surfing and eating an entire pizza as types of exercise (hey, competitive eating is a sport! ), but was overruled by my editor. The writing life definitely has more than its fair share of rejection, so be sure to celebrate the wonderful moments of success whenever you meet a goal. Having a positive outlook will definitely help you be a happier, more productive writer. Question: How do you celebrate when you accomplish a writing goal?